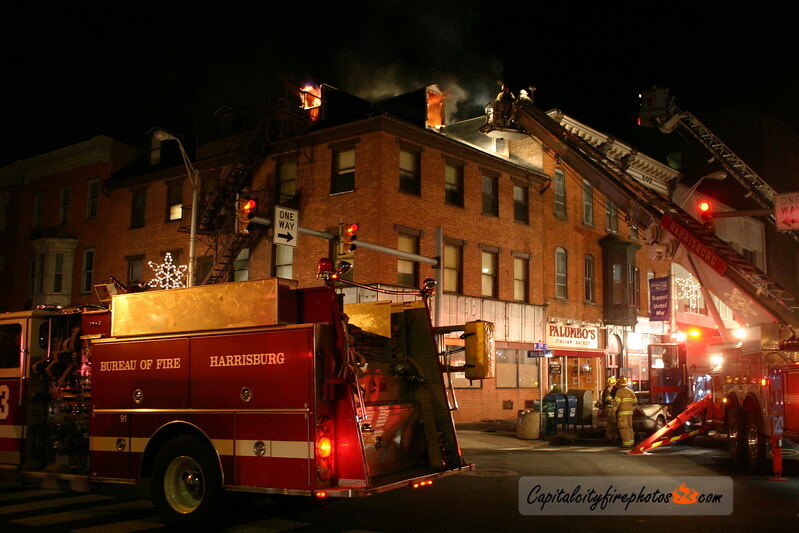 Multiple calls were being recieved for a structure fire at 2nd and Walnut Streets in the downtown around 2330 hours. Box 1-1 companies went enroute and Tower 3 arrived to fire showing from a 4-story, occupied, multiple dwelling with the ground floor a vacant restaurant. Reports of entrapment reported false after a primary search. Chief 6 (Kumpf) requested the box be filled out as high winds fanned the flames from the top floor. An aggressive attack on the fire kept it contained limiting major extension. Units remained on the scene performing overhaul before going in service. At least 8 adults were displaced. Box Alarm: Squad 8, Wagon 4, Towers 1,3, Ch 6; 1st Alarm:Wagon 3, Tower 2, Rescue 69.